Academic units are taking a range of actions to handle the increased enrollment and the demand on resources. Without question, the demands are putting an enormous stress on academic units and their faculty. Institutions will need to respond with actions that recognize the reasons for the increased student interest from both majors and nonmajors, and the role that computing plays in a wide range of disciplines and jobs. 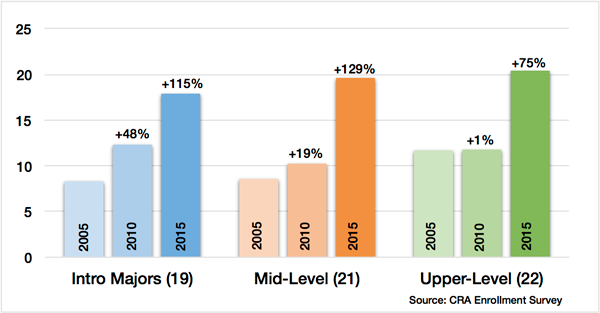 This section provides details on the magnitude of the growth of CS majors since 2006. We provide data on the growth of the number of majors as well as the cumulative growth of majors, compare the cumulative growth of majors with the growth in tenure-track and teaching faculty, and illustrate the enrollment increase for courses at three different levels of the curriculum. Most of this section focuses on doctoral-granting units, for which more abundant data is available. Data on non-doctoral granting units is included when available. Figure B.1: Average number of CS majors per unit since 2006. The current growth period began a decade ago. Figure B.1 shows how the average undergraduate enrollment has increased each year during this period. 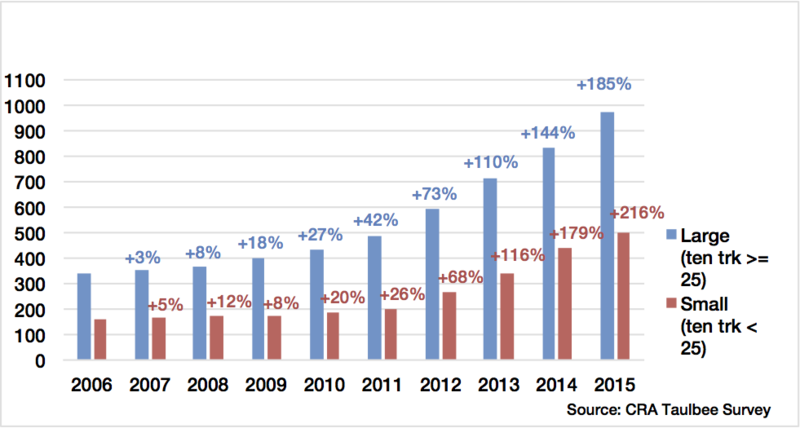 While this growth is impressive, it is natural to ask just how pervasive enrollment increases have been. To better illustrate this, we first show enrollments when partitioning academic units by tenure-track faculty size (as done by the CRA Taulbee Survey). Figure B.2 shows the average number of CS majors in “small” and “large” units, where “large” is defined as units having at least 25 tenure-track faculty. In 2015-16, 70 large and 75 small units completed the survey. Both groups experienced significant enrollment increases, with large units having roughly twice as many majors as small units. In percentages, however, the increases are very similar. We also examined the growth at public versus private institutions and found the increase in enrollment similar at both types of institutions. Figure B.2: Average enrollment by CS majors at large and small academic units (based on number of tenure track faculty). The percentages denote cumulative changes since 2006. Reporting means on enrollments could allow a few units to excessively skew the overall growth patterns. Figure B.3 shows the cumulative percentage of units experiencing different levels of increase from 2009-2014. Only 18% of the units experienced growth under 50% and only 37% experienced growth under 100%. To express this differently, over 60% of the units more than doubled their enrollment since 2009. Figure B.3: Cumulative percent of units with the indicated level of growth in CS majors from 2009 to 2014. The increase in the number of tenure-track faculty and teaching faculty in no way matches the growth in the number of undergraduate CS majors, as is illustrated in Figure B.4. As a result, faculty are teaching larger classes and more classes are taught by visitors, adjuncts, postdocs, and graduate students. According to the CRA Enrollment Survey results, many units are trying to hire teaching faculty (e.g., professors of practice or lecturers) [F. Units Response]. While the growth in teaching faculty since 2006 is over 50%, the average number of teaching faculty an academic unit had in 2015 was only six. By comparison, the average number of tenure-track faculty in 2015 was 28. Figure B.4: Cumulative percent growth of CS majors and instructional faculty since 2006. The impact of the teaching demands is reflected in the responses units provided in the CRA Enrollment Survey. Actions that units have taken or plan to take are described in [F. Units’ Response]. Course enrollment increases are being experienced in all stages of the curriculum. Increases are not only due to the increase in the number of CS majors, but also due to a significant increase in the number of nonmajors enrolled in CS courses. Nonmajor enrollment is discussed in [C. Nonmajors Impact]. Figure B.5 illustrates growth of CS majors in representative courses at the introductory, mid-level, and upper-level, at five-year intervals beginning with 2005. (See [A. CRA Committee] and [H. Methodology] for details on the course data collected.) The number of units from which such data was obtained is given in parenthesis next to the course name on the horizontal axis. There is limited historical data on CS enrollments and CS faculty from non-doctoral granting institutions from any sources including the CRA Enrollment Survey. As a result, we cannot produce analogs to Figures B.1-B.4 for non-doctoral granting academic units. 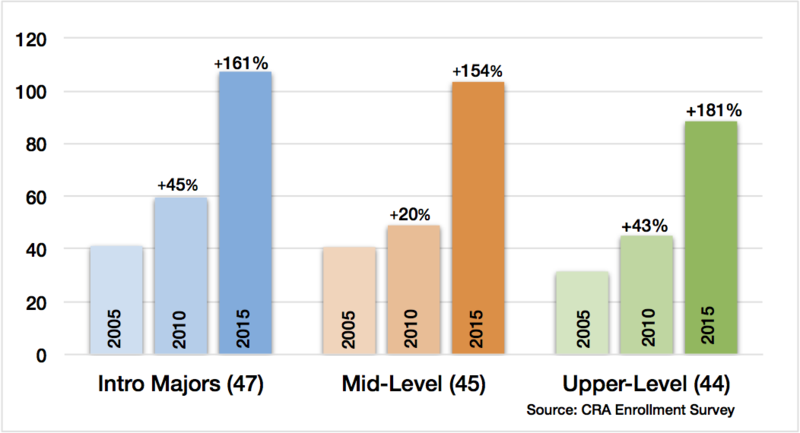 Data collected by the CRA Enrollment Survey suggests that non-doctoral granting units have also seen significant increases in all course levels, though not of the magnitude seen in the doctoral-granting programs. This is illustrated in Figure B.6, which shows enrollment by course level for non-doctoral granting units. A number of interesting questions regarding non-doctoral granting units deserve attention in the future. For example, our community needs a better understanding of whether the surge in CS majors at non-doctoral granting units is not keeping pace with the surge in CS majors at doctoral-granting units, whether non-doctoral granting units have had the resources to allow enrollment increases in the recent past, and whether there is less student interest in CS at non-doctoral granting units. The limited data from non-doctoral granting units does not provide enough insight on enrollment changes in these units. To fully understand the situation at the diverse set of non-doctoral granting units, further study is needed. Figure B.6: Average enrollment by CS majors in computing courses at non-doctoral granting units from 2005 to 2015. The number in parentheses in each category indicates sample size. A comparison of the differential growth in doctoral-granting and non-doctoral granting units can be approximated using graduation data, for which much more comprehensive data is available from IPEDS. Such a comparison can be found in [G. IPEDS Data]. That section shows the annual increases in CS degree production are lower at non-doctoral granting institutions than at doctoral-granting institutions, consistent with the limited enrollment data available from the CRA Enrollment Survey. We note, however, that CS degree production at non-doctoral granting institutions increased by approximately 50% during the period 2009-2015 (Source: IPEDS), and Figure B.6 seems to indicate that this growth in CS degree production at non-doctoral granting institutions will continue to increase in the near future. 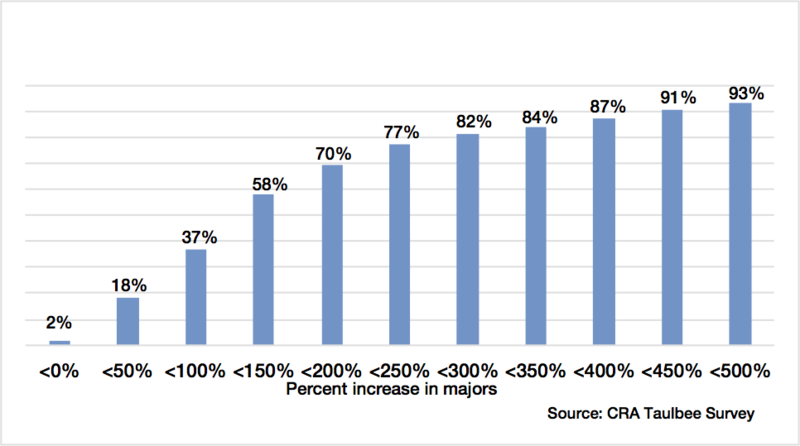 The current surge of CS majors is pervasive. Large and small academic units in public and private institutions have been affected similarly. Doctoral-granting and non-doctoral granting units are affected, though doctoral-granting units to date have experienced larger increases. While academic units are taking a range of actions to handle the increased enrollment, percentage increases in tenure-track faculty are about 1/10-th of the increase in the number of majors. As illustrated in other sections, this discrepancy in students versus faculty has impacted the operation of programs. Many units face increased faculty retention problems, are not able to hire teaching faculty into newly created teaching positions, and realize that there are not enough new Ph.D.s to fill open faculty slots in the targeted areas. The fundamental role that computing plays in society and in preparing students of all majors for a career in a competitive workforce suggests that course demand will remain high. Units need to work within their institution to develop a sustainable model that meets the needs of students (both majors and nonmajors), maintains the quality of instruction, and fulfills their role in educating students for a successful career in the 21st century. The years shown in the figures indicate the start of an academic year. For example, 2006 denotes academic year 2006-07 with data typically available early 2008. Enrollment for 2015-16 is based on preliminary analysis of data from the 2016 Taulbee Survey.